Do you know the best way to learn matched betting (apart from joining ProfitSquad of course!)? It’s by interacting with other matched bettors. Currently, there are tens of thousands of people who do matched betting who have years of experience in almost every betting offer imaginable. Matched betting can seem confusing at first, especially if you’re not used to placing bets on bookmakers and exchanges or if you’re unfamiliar with how offers such as free bets and bonuses work. However, there are many people who have been in your shoes and have progressed into seasoned matched bettors and now have a wealth of experience. These people are usually part of matched betting sites such as ProfitSquad and interact with other members through community channels such as matched betting forums and chat applications. 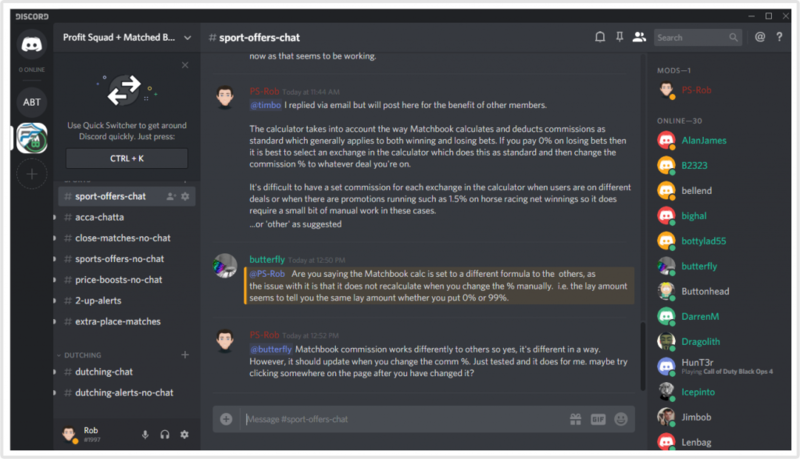 ProfitSquad understands the benefits members can have on each other which is why we provide both an active forum and a private chat group on Discord for our members. 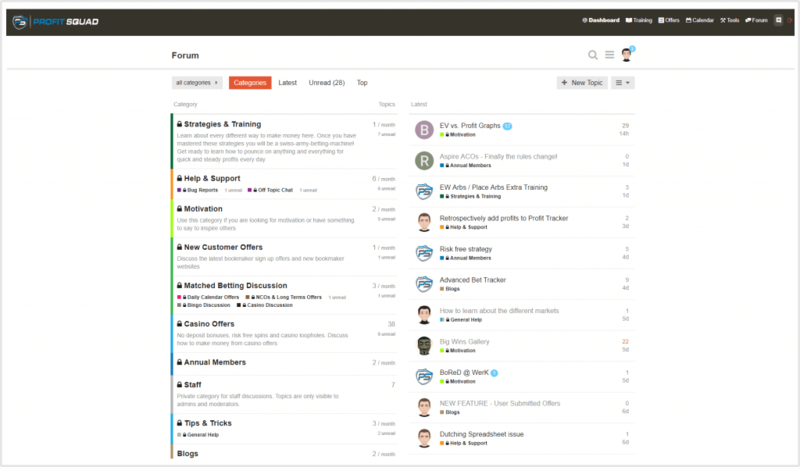 All members have access to both the forum and Discord group which can be accessed from their dashboard once logged into their ProfitSquad account. The forum is a great way to interact with other members and learn more about various aspects of matched betting. Profit Squad is made up of members with varying levels of experience and so you’ll find questions from members who have just joined as well as some advanced strategy talk from the pros. However far you are in your matched betting journey, the Profit Squad forum is a great way to develop your knowledge further and to meet some of the other members who make Profit Squad what it is today. As well as hosting a popular matched betting forum, Profit Squad also provides a private Discord group for members. Discord is a chat application which allows users to chat in real-time with each other. There are various dedicated matched betting chat rooms for thing such as sports offers, casino offers, dutching chat, price boosts, extra places, 2 Up alerts and much more. Users can set notifications for any channel so that they are alerted when a new offer is posted, they receive a message or when there is a close match for specific offers. Since launching in 2018, our Discord group has proved extremely popular. There are usually members online 24/7 and so it’s a great place to ask questions, let others know about profitable offers you have found or simply to chat to like-minded matched bettors at any time of the day. If you’re looking to join a community of friendly and helpful matched bettors then the ProfitSquad matched betting forum could be the perfect place for you. All members have the same goal – to make money! and are more than willing to help others to do so. You can sign up to Profit Squad for 14 days for just £1 by clicking here and within minutes be part of the best matched betting community online.